The year 1989, the first TIME Leeb portable hardness tester ROCKY HLN11A was presented to the market. Yet, the new generation of this high quality, popular hardness test r is still the best selling Leeb tester world wide. 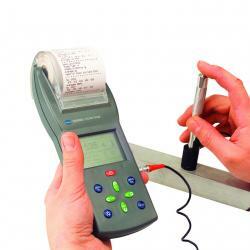 Often copied, but never equalled, the TH-110 is the 3rd generation of the ROCKY dynamic Leeb hardness testers. (standardized according to ASTM A956). Most metallic products with a minimum solid mass starting from 0.5kg can be tested according to the Leeb principle. The display shows hardness values in all common hardness scales. The instrument is equipped with re-chargeable batteries that provide over 16 hours continuous operation.